2018 Subaru WRX STI Type RA; Worth the Extra Cost? The 2018 Subaru WRX STI Type RA (Record Attempt) model is coming soon and early reviews from the press are negative. Is it worth the extra cost? Subaru fans in the U.S. have been left out in the cold in the past when special edition WRX STI RAs have been produced, but Subaru of America gets this one for North American fans. 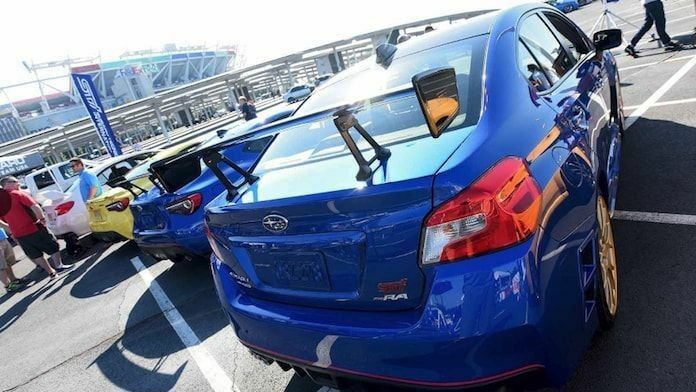 The 2018 Subaru WRX STI Type RA was produced after the Subaru 2017 Nurburgring record attempt, the fastest lap ever for a four-door sedan. It’s a limited production STI with only 500 examples being built. The new 2018 Subaru WRX STI Type RA comes with a price tag of $48,995 plus destination ($860), while the base 2018 Subaru WRX STI can be had for $36,095. This represents a premium of $10,400 over a base STI equipped with Recaro seats and keyless entry and ignition (both features are standard on the Type RA). So is it worth the extra cost? Engineering Explained host Jason Fenske had some wheel time in the WRX STI RA and gives his input during the drive in the video below. The Type RA gets a new intake and new exhaust system that gives the standard 2.5-liter boxer an extra 2hp and reduces back pressure by 50 percent. It also gets a tweaked engine control unit (ECU) that commands a bit more maximum boost, sodium-filled exhaust valves, and new pistons only on the Type RA. This produces 5 additional horsepower over the EJ25 2.5-liter boxer in the standard WRX STI. The torque is unchanged at 290 lb. feet, but the third gear ratio is more aggressive (1.590 instead of 1.521) in the six-speed manual gearbox to take advantage of the increased lower end torque. The torque curve map was also changed between 2-3,000 rpm to take advantage of the third gear changes. Other changes includes a carbon-fiber roof reducing weight by 5 lbs, and lowering the center of gravity 2mm, 19-inch wheels vs standard 18-in. Subaru says the total difference in weight is 68 lbs vs a base STI with Recaro seats coming from the lighter wheels, tire repair kit, carbon roof, adjustable rear wing, and rear seat armrest. It also gets an upgraded suspension with Bilstein-sourced and STI-tuned dampers, and rear wheel vents to reduce lift and drag. Subaru says the Type RA gets a 1.4 percent less drag coefficient over the base STI. The revised wing, in conjunction with a new front splitter and rear valance, reduces lift at both axles without inducing more drag. We haven’t driven the new WRX STI Type RA, so we can’t give an opinion. But early reviews from those who have, say it’s not worth the extra cost. The 2018 Subaru WRX STI Type RA will arrive in showrooms in the next couple of weeks. Watch 2018 Subaru WRX STI Type RA Review - The $50,000 STI from Engineering Explained and get Jason Fenske’ take on the newest STI.